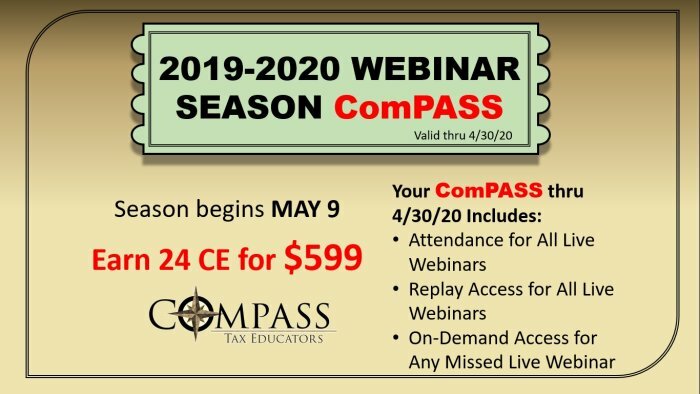 Compass Tax Educators is offering an all-access pass to its live webinar events from May 1, 2019 through April 30, 2020. You can earn 24 CE/CPE for one annual flat rate! Attendance at all live webinar events from May 1, 2019 through April 30, 2020. This includes scheduled, bonus, and premium webinars. Replay access for all live webinar events from May 1, 2019 through April 30, 2020. On-demand access for any missed live webinar events (note: on-demand webinars currently do not provide NASBA CPE credit for CPAs). These webinars have been designed by Gregory & Associates, Inc. to meet the requirements of the IRS Return Preparer Office, including sections 10.6 and 10.9 of Department of Treasury's Circular No. 230. This does not constitute an endorsement by the IRS RPO. IRS Provider Number: NMVBP.